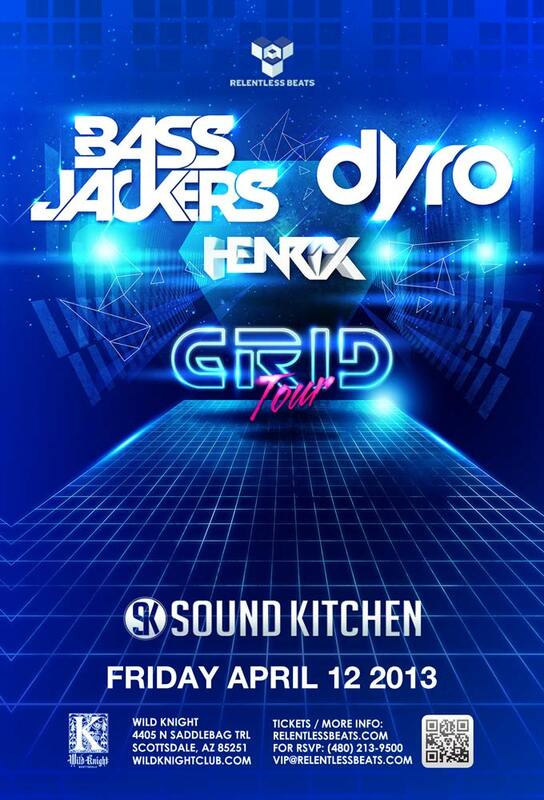 Relentless Beats presents a special edition of Sound Kitchen, The Grid Tour featuring Bassjackers and Dyro with support from Henrix at Wild Knight in Old Town Scottsdale on Friday, April 12, 2013. Bassjackers, a.k.a. Marlon Flohr and Ralph van Hilst, had not foreseen what was coming when they started out with their collaboration. Marlon was already DJ-ing for a while and Ralph experimented a lot with making different kinds of dance music. Marlon was mainly playing house music at the time and then the idea came to push Ralphs productions in that direction, so that Marlon could play the tracks in his sets. The first track they were both satisfied with was ‘Beat Cut’. ‘Beat Cut’ got picked up by Fedde le Grand and from then on things went real fast. They recently did remixes for the biggest artists, for example the remix for Dada Life which reached a #1 position in the “Hypem” charts and an official remix for Martin Solveigs monster hit ‘Hello’. They released their tracks on various labels like Spinnin Records, Samsobeats, DimMak, which were supported by the worlds greatest DJs. From Tiesto to Steve Aoki, from David Guetta to Claude Vonstroke, everybody loves the Bassjackers bangers. Also famous rapper/producer Jeremaine Dupri noticed Bassjackers, he decided to rap on top of a Bassjackers beat and put it on his blog. The future has a lot in stock for Bassjackers, their release ‘Mush Mush’ on Tiesto’s label Musical Freedom was huge at the Miami Music Week 2011 and is already supported by Tiesto, Sander van Doorn, Benny Benassi, Dada Life, Sidney Samson and many more. Another release will be expected soon and will drop on Afrojack’s Wall recordings, this one also gained massive support already and Tiesto even did his own private bootleg on one of the tracks. Next to these releases they have done a lot of remixing for high profile artists, and some serious collaborations, so beware..
Seemingly coming out of nowhere, Miami-based Henrix capped off 2012 with two tracks in the A.D.E. Buzz Charts and managed to start off 2013 as being named one of the 2013 Artists to Watch by Dancing Astronaut, Fresh New Tracks, and The Beat Mill. With his unique style of production that embodies percussive drops and massive melodic breaks; Henrix has managed to establish himself as the quintessential ‘Sound of Miami’ and shows no signs of slowing down this year as he takes that Miami sound to BIG releases on SIZE RECORDS, Mixmash, Universal Republic, and more. Tickets are currently $12. Purchase your tickets HERE.